Nibali to lead Liquigas at Tour of California. Dinner reservations made. Dinner in Nevada CIty, baby. Twisted Spoke hopes Vincent Nibali doesn’t mind: we made him a dinner reservation at the best Italian restaurant in Nevada City, California for May 15th, the night before the opening stage of the Tour of California. A little bit of home, ya know? Cirino’s, 7:30, table for two, bring a teammate. Dress casual, jeans are fine, no team wear, please. Foodie web site UrbanSpoon claims Cirino’s is top notch tasty. A good meal washed down with a bottle of the 2004 Franciscan cabernet should kick things off in style. 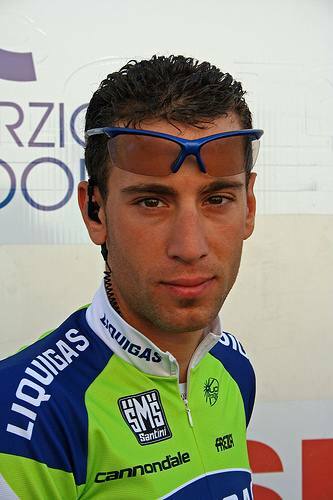 Nibali will lead team Liquigas at the Tour of California, which runs from May 16th – 23rd. The 25 year-old Italian should be on form after riding the Ardennes Classics and will use California as the homework for the 2010 Tour de France. “It’s an important race for our bike sponsor, Cannondale,” said Nibali. “I will aim to win a stage and if there is chance I will try to win the overall.” And he’s not talking about the all-you-can-eat. P.S. Vincent, start with the Cirino style calamari, then the shrimp risotto. Yummy. « Euskatel announces internal doping controls, tests positive for skepticism.